The Acela Express is Amtrak's new high speed train for the Northeast Corridor, located in the northeastern USA. It is a distant relative of the French TGV high speed trains, because TGV builder Alstom participated in the consortium that designed and built the Acela Express. However, despite its appearance here in TGVweb, it is misleading to describe the Acela Express as a type of TGV. While the two may look similar at first sight, they have very few components in common. In addition, don't miss a special feature article on the new NEC maintenance facilities by Jeffrey Nagy, Mechanical Foreman at Amtrak's Ivy City Maintenance Facility in Washington, DC. Amtrak, the U. S. passenger rail carrier, holds the largest share of the commercial transportation market between New York and Washington, with about 45% (or 12% of the total market). This market is located in one of the most densely populated areas in the United States, the Northeast Corridor (NEC). The Corridor stretches from Washington, DC at the southern end, through a tight string of cities including Baltimore, Wilmington, Philadelphia, New York City, the Connecticut coast and Providence, to Boston at the northern end. In the process of improving its operations on the Northeast Corridor, Amtrak is acquiring 20 new high speed (150 mph, or 240 km/h) tilting trainsets, which will use the existing tracks. The NEC is notorious for its many curves, especially north of New York. Between New York and Boston, the track makes the equivalent of over 11 full circles! This dictated the choice of a tilting train, to allow higher speeds in curves without causing passenger discomfort. Some sections of track were upgraded for 150 mph operation, and the entire NEC was electrified to Boston by late 1999. 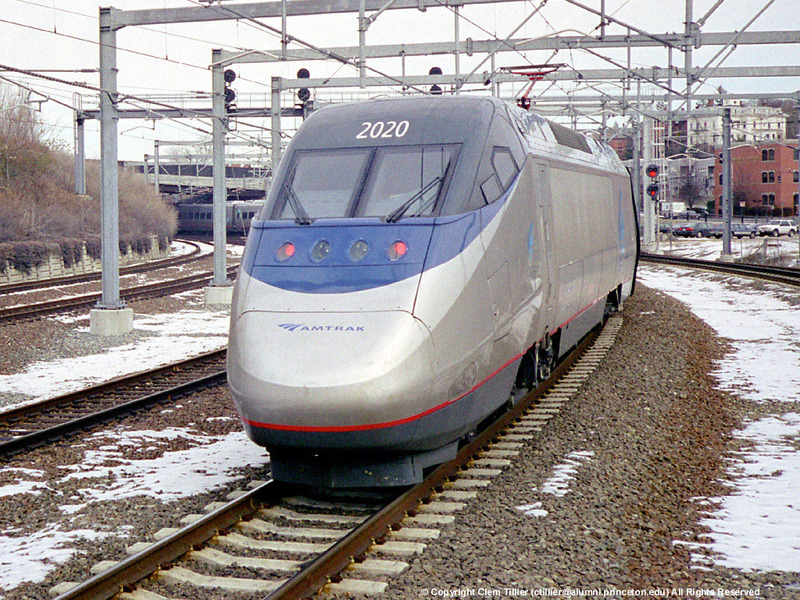 Acela Express service began in December 2000 after a series of technical glitches that delayed the originally planned start of service in November 1999. Amtrak announced the award of the competitive contract on 15 March 1996. A consortium led by the Canadian firm Bombardier won with its design, a high speed tilt train given the marketing name "American Flyer". Bombardier, which holds exclusive rights to TGV technology in North America, was joined by Alstom, maker of the French TGV. 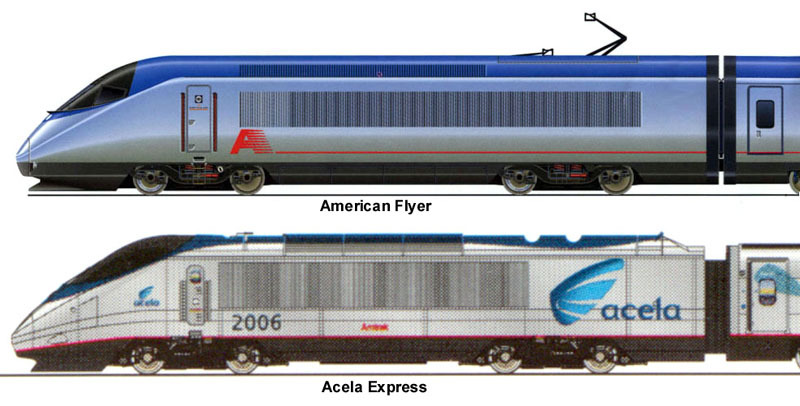 The American Flyer was chosen over two other tilt train entries from competing bidders. The first of these competitors was the American ICE (Picture), proposed by a consortium headed by Siemens, maker of the German ICE. Siemens demonstrated the German version of the ICE in Metroliner service on the NEC in 1993, and then on a nationwide tour of the United States. The second competitor was the X2000, proposed by ABB, maker of the Swedish X2000. Like the German ICE, a Swedish version of the X2000 trainset was shipped to the United States and demonstrated on the NEC in 1993. In making its final, long-awaited choice, Amtrak was able to play off the three bidders against each other in order to get the best train for the least amount of money. Amtrak freely admitted that Bombardier's attractive financing package swayed the decision more than the relative technical merit of the American Flyer. Bombardier's experience with North American railcar construction was also a factor. This explains why the X2000, which had been a popular favorite after appearing on U.S. soil, was dropped from consideration when ABB raised its price excessively. The Acela Express was largely built on U.S. soil, as stipulated in the Amtrak contract. Bombardier's plants in Barre, Vermont and Plattsburgh, New York, performed much of the manufacturing. Alstom also furnished some components made in France. The funding scheme for the project is rather unusual, for it places very little burden on Amtrak. Bombardier is financing the $611 million to purchase the trains (including additional electric locomotives) and part of three new maintenance facilities, as well as to operate and maintain the equipment for 20 years. Amtrak's ability to repay Bombardier will come from additional revenue that the Acela Express is expected to create when it enters service, estimated by Amtrak at $200 million per year. Furthermore, Bombardier will be subject to drastic financial penalties if its performance guarantees are not met. The U.S. congress specifically mandated the timing goals as a condition for providing funding. In early 1999, a minor controversy arose concerning the trainsets, which were reportedly built 10 cm (4 inches) wider than specified. In some areas of the NEC, this reduces the maximum permissible tilt from 6.5 degrees to 4.2 degrees due to the constraint of the AAR Plate C clearance standards. Bombardier and Amtrak claimed that this would not significantly impact schedule timing. Amtrak unveiled the Acela brand on March 9, 1999. The name, conceived by the New York branding firm IDEO, is intended to reflect a combination of acceleration and excellence. The Acela brand now covers the entire range of NEC services and is not limited to the Acela Express service. The Acela Express name replaced the marketing name American Flyer, previously used by the Bombardier consortium. The first Acela Express entered testing at the Pueblo, Colorado Transportation Test Center in mid 1999. The second, meanwhile, was in testing on the NEC. The trains were supposed to enter service in late 1999 and be phased in over the following year, but additional technical problems, first with excessive wheel wear and later with defective bolts and other assorted issues pushed back initial service to December 2000. The Acela Express cuts the Boston - New York run to 3:23 (from 4 to 5 hours), and the New York to Washington run (the territory of Amtrak's 125 mph Metroliners until the introduction of Acela) to 2:45 from three hours. Amtrak expects this to attract many customers who currently use airline shuttles or drive. The extent of the TGV heritage in the new trainsets is limited to traction components and truck (bogie) technology. As such, the Acela Express is only distantly related to the French TGV. 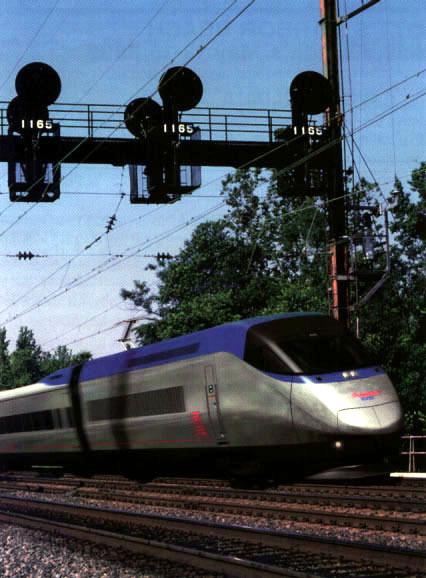 The Acela trainsets were built entirely using existing and proven technologies. The challenge was to adapt these technologies to Federal Railroad Administration regulations in general, and the Northeast Corridor environment in particular. Supply Voltages: 25kV 60Hz AC, 12kV 60Hz AC, 12kV 25Hz AC. Configuration. Each trainset is made up of 6 cars with a power car at each end, for a total of 8 semi-permanently coupled vehicles. There are four Business Class cars, a Cafe car, and a First Class car. The trainset is designed to operate at up to 150 mph. The interior layout of an Acela Express trainset is illustrated below. Changes in traction supply must be accommodated automatically while travelling at maximum speed, without interruptions in HEP (head end power, or "hotel power" for lights, air conditioning, etc). Changes in the overhead supply are signalled to the train by wayside transponders that are part of Amtrak's ACSES system; this allows the tap changer on the main transformer to reconfigure the primary windings in time for the phase break. Traction Systems. The power cars use the newest TGV (3rd generation) traction technology. (See here for a more complete explanation). The main transformer is mounted underfloor. Its primary winding is split into two parts to accommodate the different supply voltages mentioned above; it has four secondary windings, each feeding a PWM rectifier that supplies a voltage regulated DC link which operates at 2850 VDC. The DC link feeds two inverters (one per truck) based on water-cooled GTO technology. The inverters supply three-phase, frequency and voltage controlled waveforms to the asynchronous induction traction motors. Each power car develops 4600 kW of tractive power, for a total of 9200 kW per trainset, and can start with 50,000 lbs of tractive effort. Under regenerative braking, each power car can provide 3000 kW of braking power. Should the catenary not be receptive to the regenerated power, a chopper modulated resistor grid is used to dissipate the energy (the "dynamic brake"). EMI (Electromagnetic Interference) is a specific concern in the traction components since modern AC traction drives operate at frequencies that can potentially interfere with the cab signal and other safety critical systems. This is an especially difficult problem on the Northeast Corridor, where many relatively low frequencies must be protected from interference. Auxiliary Power. Each power car has a dedicated HEP (head end power) inverter with enough capacity for a 1+10+1 trainset configuration. The inverter operates off the DC link and provides 480V 60Hz three phase power. The system is redundant; should the HEP inverter in one power car fail, the other one's takes over. In case of a second failure, one of the traction inverters can be used at the cost of somewhat reduced traction power. Trucks and Tilt System. The six passenger cars are fitted with an active tilt system based on Bombardier's proven LRC (Light, Rapid, Comfortable) technology. The tilt system compensates a maximum of 75% of the lateral force felt by the passengers when running through a curve, and becomes fully active above 60 mph. The trucks are related to the standard TGV design, with a long wheelbase dual transom H frame welded steel construction with outboard mounted tapered roller bearings. There are three brake disks fitted to each axle (as opposed to the TGV's four). As in TGV practice the primary suspension is swing-arm coil spring, and the secondary suspension uses air springs with a coil spring backup in case of pneumatic failure. The tilt system is accommodated by a tilting bolster, which is suspended from the truck frame by four swing arms. The tilting is hydraulically actuated by an under floor hydraulic power unit. Each car has a tilt control processing unit and tilts independently of the others by up to 6.5 degrees either side of vertical; tilt functions are controlled by the tilting master sensor and master controller located in the power car. The power cars themselves do not tilt. Carbodies. Vehicle structures are built from stainless steel and are designed to survive major impacts. Crash energy management techniques based on 3rd generation TGV technology control the structural deformations in the event of an accident, to increase the safety of the passengers. Under floor equipment is specially reinforced to withstand the rigors of operating in urban areas, where shopping carts, tires and other debris frequently find their way onto the tracks. (The Northeast Corridor is only partially fenced in, as opposed to European high speed lines.) The Acela Express is the first train to comply with the Federal Railroad Administration's Tier II crashworthiness standards, touted to be the toughest in the world. The downside of the heavy emphasis on passive safety is the significantly higher weight of the trainset, compared to worldwide high speed rail practice. The Acela Express is built about 45% heavier than a typical TGV. Signalling and Safety. For operation at 150 mph the trainsets are fitted with a two frequency, nine aspect cab signal system to supplement wayside signaling. (In a cab signal system, signaling information is transmitted through the rails in the form of electrical signals, decoded by the train and displayed to the engineer directly in the cab). An ATC (Automatic Train Control) system watches over the engineer, who is in full control of the train at all times. In addition, Amtrak's ACSES system (Amtrak Civil Speed Enforcement System) ensures observance of all speed limits. Monitoring System: The train's digital monitoring system provides status information to the cab and the crew office. Data on propulsion, HEP, tilting, braking, and fire protection systems can be displayed on screens, as well as wheel bearing temperatures and truck hunting dynamics. (At high speeds trucks may go unstable in the case of a damper failure; if that ever happens the train's speed is reduced until the side-to-side hunting motion stops.) The monitoring system is based on LonWorks technology. Noise. The specifications require a sound level of 90 dBA or less at 100 meters from the track centerline at 150 mph, and 75 dBA or less at 5 meters from the track centerline when stationary with all cooling fans and auxiliary equipment operating simultaneously. Interiors. The train is fully accessible for the disabled. The pneumatically operated sliding plug doors are designed for both high and low platforms. The intercar passageways are spacious and as warm and quiet as the passenger cabin, and feature pneumatically operated sliding doors. The First Class car seats 44 passengers in a 2-1 reversible seat configuration, with audio and video entertainment and a 115V outlet available at each seat. Airline type food service is provided through two food galleys. There is a phone booth accessible to the disabled, as well as enclosed and open type seat groups for business meetings. Other features include enclosed airline style luggage racks, a magazine display, two spacious restrooms and a garment bag holder. The Business Class cars seat 71 passengers in a 2-2 configuration, with audio entertainment only. A 115V outlet is available at each seat. Phone booth, enclosed and open seat groups, 2 restrooms, enclosed luggage racks, and a garment bag holder are provided as in first class. The Cafe (dining) car has capacity for 34 passengers, and features a lounge area with high and low stool seating, a dining area for meals, a business center with fax, copier and printing facilities, two phone booths (one of which enclosed), video and audio entertainment, and galleys for coach passengers. A crew office can provide en-route ticketing, scheduling and seat assignment changes. A front view of the American Flyer power car. Several details differ in the final Acela Express design. From a 1997 Bombardier marketing brochure. Two profiles of an Acela Express Business Class car. 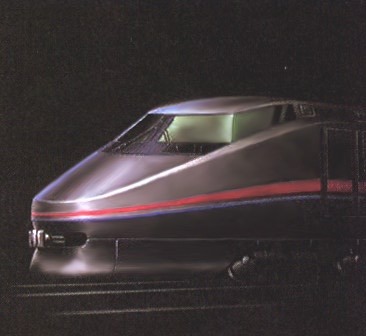 Top, as shown in a 1997 American Flyer marketing brochure from Bombardier. Bottom, as shown in the Acela Express seatback safety brochure. The interior layout of an Acela Express trainset. 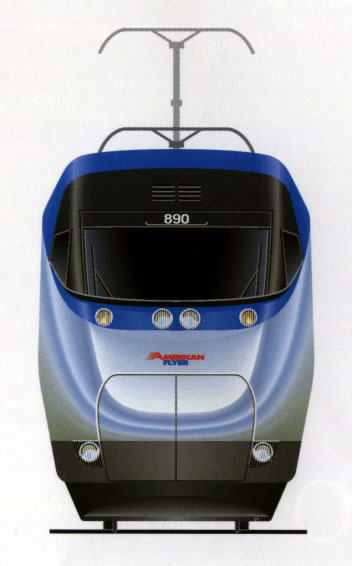 An early (1997) artist's impression of the American Flyer, as Bombardier's proposal was then named. Several details differ from the final Acela Express design. From a Bombardier marketing brochure. 15 March 1996 Contract awarded to Bombardier consortium. 09 March 1999 Acela brand unveiled by Amtrak. September 1999 Service start delayed due to wheel wear problems uncovered in testing. mid-2000 Service start delayed again due to failing bolts on bogies. 30 May 2000 Amtrak announces it can't achieve a 3-hour NYC - BOS trip time. 11 December 2000 Service initiated with one daily Washington - Boston round trip. Don't miss a special feature article on the new NEC maintenance facilities by Jeffrey Nagy, Mechanical Foreman at Amtrak's Ivy City Maintenance Facility in Washington, DC. A wheel diagnostic machine, used to measure wheel profiles every two to three days. A tandem under floor wheel profiling machine by Simmons Machine Tool Corp., capable of re-profiling the wheels on an entire trainset in eight hours. A Management Information System (MIS), which coordinates all maintenance tasks, labor and materials. Several interesting links are available. See under World Links by Country > USA > Acela Express. American Flyer brochure, Bombardier, courtesy of Mark Williams. System Compatibility of the HST. Chance and Grabowski, ASME Joint Railroad Conference, 1997. Tilt System for Amtrak High Speed Trainsets. Kolig and Hesser, ASME Joint Railroad Conference, 1997. Program Update: Amtrak's High Speed Trainset Program. Bell and Annechini, ASME Joint Railroad Conference, 1997.